One of the most architecturally modern nations, the United Arab Emirates (UAE) is also known for its rich culture and heritage. A new world thrives here together with the old; and while the emirates attract tourists with their stylish offerings, a peek in the country’s preserved culture makes for an interesting insight. Colonies of modern, towering buildings stand in cohesion with imitation style Arabic buildings in Sharjah. The third largest city of the UAE, it is the country’s cultural capital and home to more than 600 mosques. Designed on lines of Islamic rules, some mosques here have architectures inspired from popular mosques around the world while some simply mark definitions of their own. King Faisal Mosque, the largest mosque in the emirate is one such. Simple in style, with no intricate designs, it is grand enough to seize one’s imagination. It was the largest mosque in the UAE until 2007 when the Shaikh Zayed Grand Mosque in Abu Dhabi opened. It still is one of the most modern styled mosques across the UAE, with the reason for no embellishments or patterns on its walls being that no worshiper is distracted by any means. Situated on Al Itihad Park, adjacent to King Faisal Street, it was inaugurated on January 23, 1987, occupying a distinctive and strategic address in the emirate. 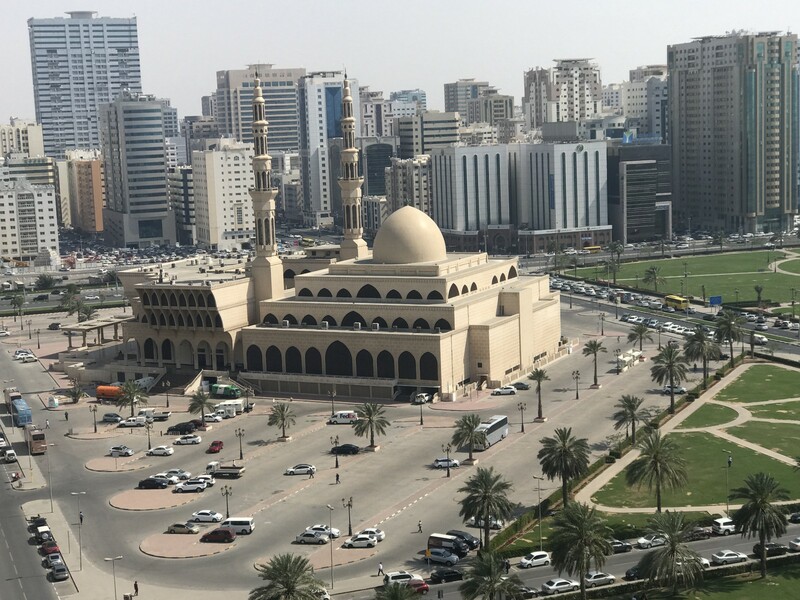 It is actually because of its location being in the heart of Sharjah, close to the Central Souq, that it holds such importance. Its construction, design, engineering being other vital reasons. 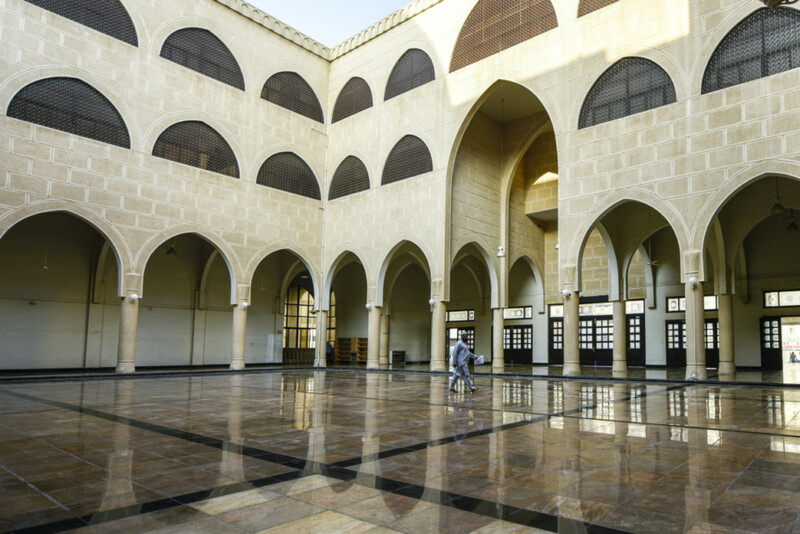 Named after the late King Faisal bin Abdul Aziz Al Saud, former ruler of Kingdom of Saudi Arabia, the mosque took two years to build. Big enough for more than 16,600 people to pray at one time, it is divided into several halls, which are demarcated with doors. The building rises in three distinct levels, with each level designed to appear rotated, creating a multi-pointed star pattern, echoing in a unique way the manner in which Islamic cultural stars are drawn. The charm of this mosque is that it is very well-suited for worship with acoustics and the voice of the Imam in the vast but quiet space, coming together to create a very special atmosphere. Inside, the first floor is the main chapel that is used as a prayer hall by men while the women pray at the ground floor. Interestingly there are maintenance offices and stores, as well as the offices of the Women’s Charity Association in the mosque. A library inside contains about 7,000 books on Islamic history and thought, and the modern books of Hadith and Sharia, along with scientific, literary and cultural works. Although, the mosque is not opened for non-Muslims and visitors are not allowed one can marvel at it from the outside. However, a trip to the Al Noor Mosque can be made for experiencing the Islamic culture and indulging in its richness as a tourist.